I honestly think poverty and bad government is making this Ebola virus spread at a rapid rate. This is the shocking moment a man suffering from Ebola was bundled into the back of an ambulance after he caused mass panic at a market in Liberia when he wandered in looking for food. 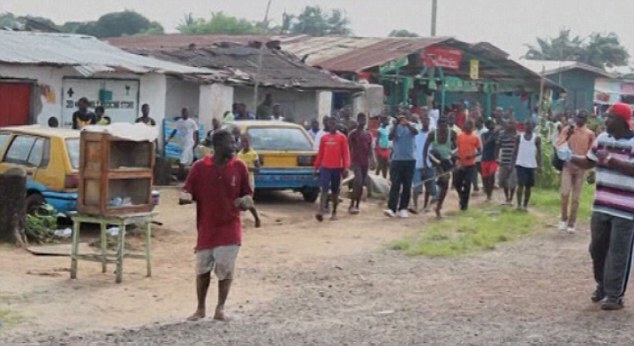 The unidentified man walked into a market in the capital Monrovia - which has been badly hit by the worst ever outbreak of the disease - only to be chased from the area by panicked shoppers. Attempting to make off with loaves of bread, the man is then chased down the road by men wearing yellow protection suits, who eventually catch him and bundle him into the back of a UNICEF vehicle. People were scared of him and angry too.. When they eventually caught him.. 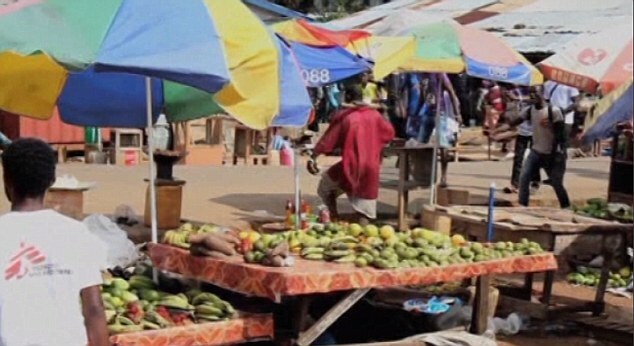 It was revealed that food in countries hit by the West African Ebola outbreak is becoming increasingly expensive and difficult to find, as farmers are barred from accessing their fields in order to prevent the disease spreading, a UN food agency has warned. Surrounding countries have closed land borders, many airlines have suspended flights to and from the affected countries and seaports are seeing less traffic, restricting food imports to the hardest-hit countries. Those countries - Guinea, Liberia and Sierra Leone - all rely on grain from abroad to feed their people, according to the UN Food and Agriculture Organisation. The World Health Organisation is asking countries to lift border closures because they are preventing supplies from reaching people in desperate need. 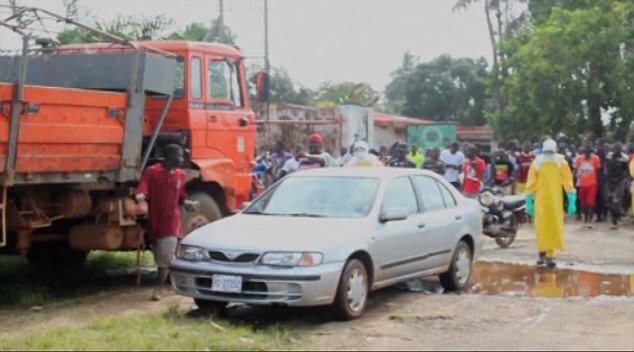 Ivory Coast decided last night to keep its borders with Guinea and Liberia closed but said it would open a humanitarian corridor to allow supplies in. The news comes as Ivory Coast's football association said it will host the country's African Nations Cup qualifier against Sierra Leone this weekend following a special national security council meeting. The decision, announced in a government statement published in local media today, comes one week after the government said it would not allow the match to go ahead, citing health concerns. As of August 29, the World Health Organization had confirmed 935 cases of the deadly virus in Sierra Leone - including 380 deaths - though that number is likely to have since risen. Does anyone now see why education, good governance, honest leaders, leaders who are visionaries and a good economy is important? I can't blame the guy, he must have been seriously hungry and i am sure that they were not providing them with enough food. Someone needs to donate not only medical supplies to these people but food, clothes and other supplies too. God please take control. I just had to quickly write this. Thanks for checking out my blog..
it so sad he was just hungry.